Bat-like creature 'wakwak' found in Zamboanga: Real or fake? Home / news / photo / viral / Bat-like creature 'wakwak' found in Zamboanga: Real or fake? 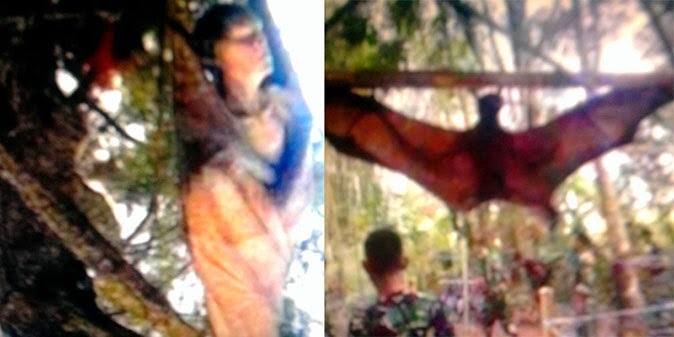 A bat-like creature known locally as "wakwak" was allegedly found in Zamboanga del Sur. Is it real or fake? Take a look at these viral photos. A certain Angging Bernacer Rhejidour from Pagadian posted the pictures on Facebook last Saturday, February 28. She said in a comment that the creature was shot by soldiers in a camp in Pulacan and the photos were taken by her husband. Upper Pulacan is a barangay in the municipality of Labangan in the province of Zamboanga Del Sur. It is where the headquarters of the 1st Infantry (Tabak) Division of the Philippine Army is located. Post by Angging Bernacer Rhejidour. A wakwak has fangs, wings, and an elastic tongue and, according to stories, feeds on unborn babies inside the mother's womb, as well as flesh and blood. Rhejidour relayed that the creature found in Pulacan was a female and a resident of Tukuran, Zamboanga del Sur. The wakwak allegedly begged and was freed.